It was once said that as a general rule of thumb when building a car, it’s best to stick with aftermarket parts that match its country of origin. A Japanese car is usually best when equipped parts from that country’s tuning shops, a European car is made best by parts form Europe and an American car should be equipped with parts from the good old USA. Today more than ever though, I think that mantra has been proven obsolete. As people continue to get more creative with their builds, we are finding that some of most exciting cars out there are the ones most heavily infused with elements from outside their brand’s country of origin. 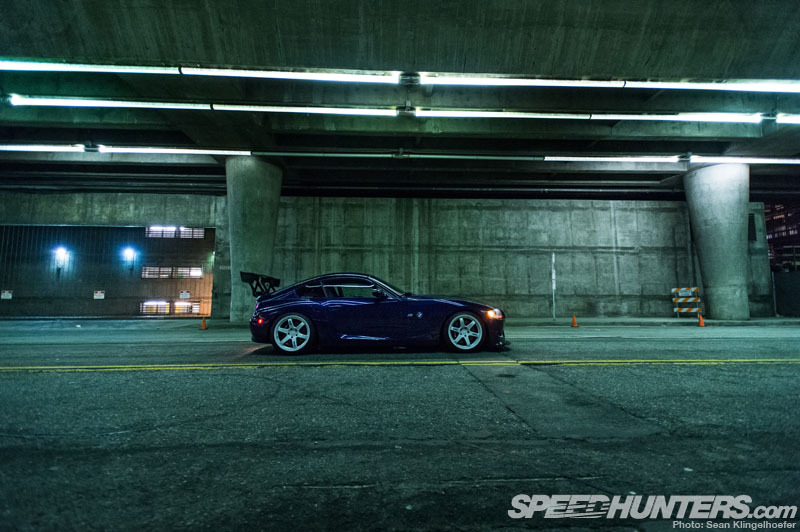 Take a look at an RWB Porsche or even something like the Mustang RTR-X and you’ll get where I’m coming from. 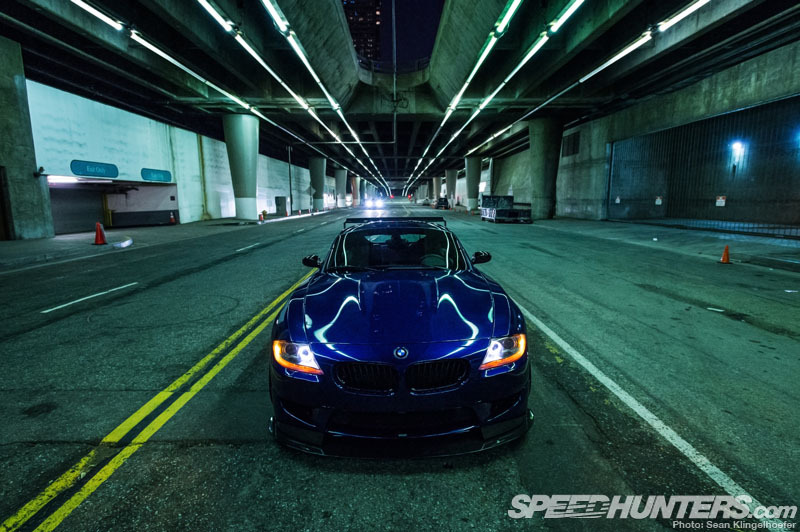 You also have cars like this BMW Z4M built by Southern California’s Platte Forme a.g. – a European car tuning shop that happens to look to Japan for a lot of its inspiration and car-building philosophy. If you’ve followed the American time attack scene, you are probably familiar Platte Forme’s highly competitive E46 M3 and some of the other track cars its built. The shop’s founder Toan Nguyen has been working on cars for more than a decade now, and a little over two years ago he realized the dream of opening up his own tuning shop. And while Platte Forme specializes in European cars, Toan has never really been about the luxury side of these European offerings. For him and the rest of the Platte Forme crew, it’s all about motorsport. There’s a racing element to just about every car the shop works on. It’s from this focus on motorsport that a lot of the Japanese influence comes in. Toan has always admired Japanese tuning parts for their balance of quality, function and aesthetics. It’s this so-called ‘golden ratio’ that’s led the shop to integrate these Japanese elements into its builds. 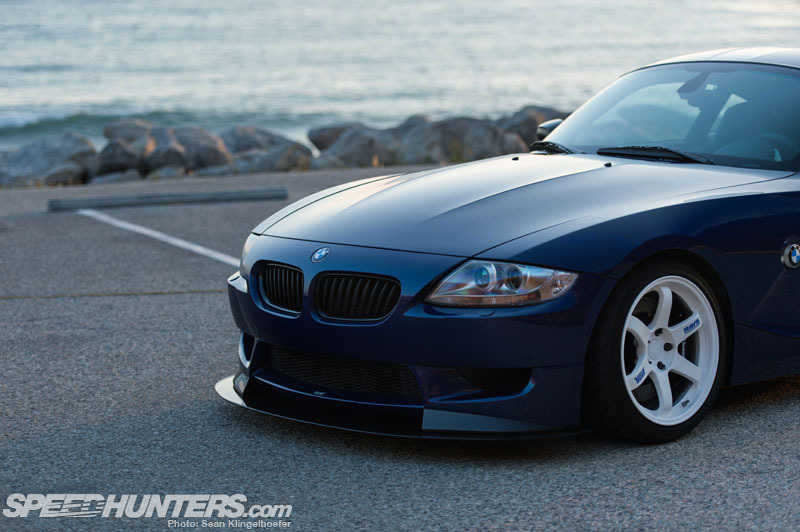 This customer-owned Z4M is an example of the more street-oriented side of Platte Forme’s work. The goal here was to build a car that could serve as an urban commuter during the week, and then head out to the track on the weekend and lay down some competitive lap times. It’s a goal that seemed to fit perfectly with the shop’s ethos. 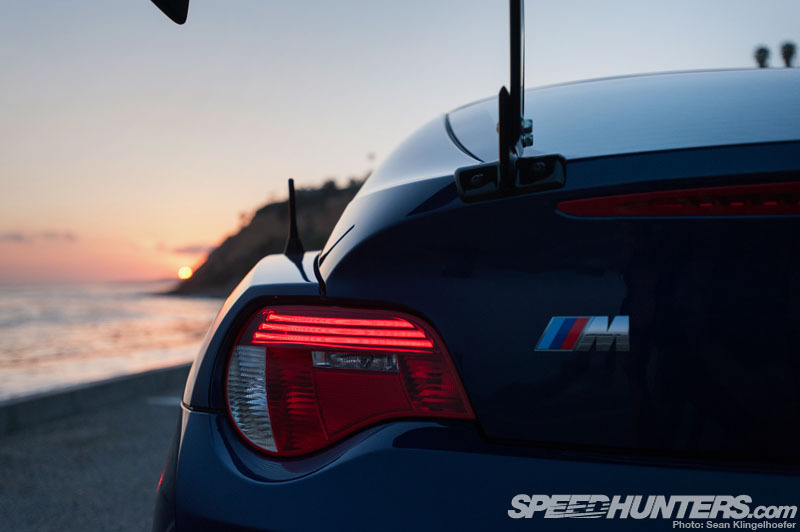 Rather than building a car with a ton of horsepower, the idea would be to make the Z4M quick threw use of high quality parts and an even balance between each area of the car’s abilities. 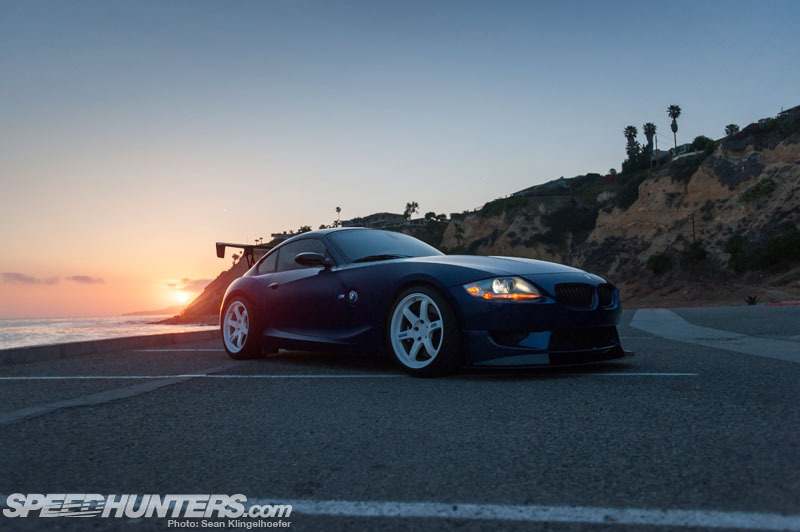 When you look at the BMW there isn’t one thing that stands out as dominating the build. Instead, it’s a well-rounded mixture of small elements that come together to create a something that is both functional and aesthetically-pleasing. 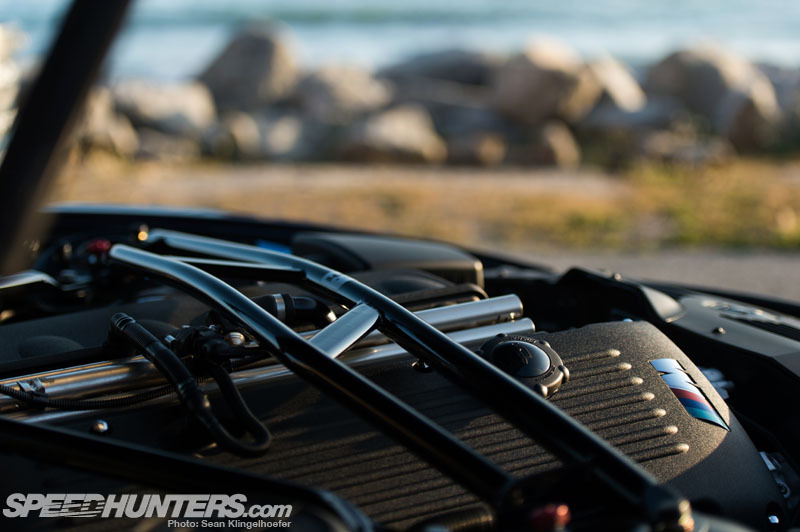 Beginning under the hood, you’ll find nothing drastic outfitted to the Z4M’s inline six. 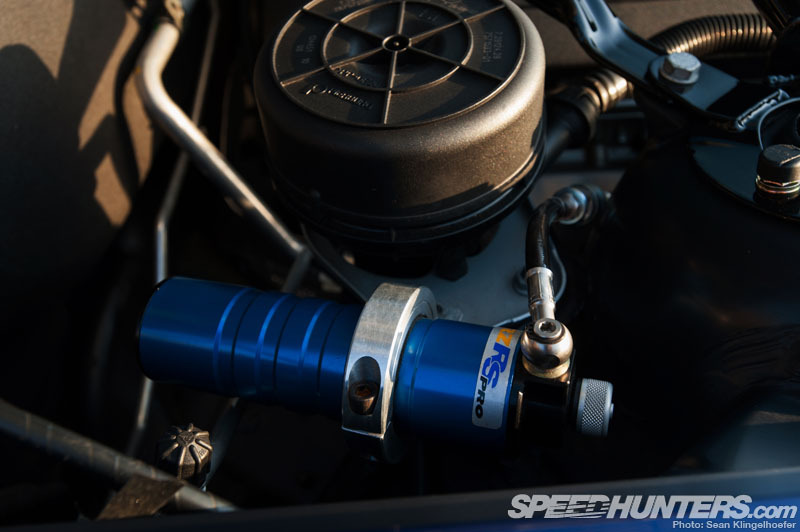 The internals are completely original, but a European market header and high-flow catalytic converters have been added to free up some extra power. There’s also a BMC air filter, an Evolve tune – and well, that’s pretty much it. 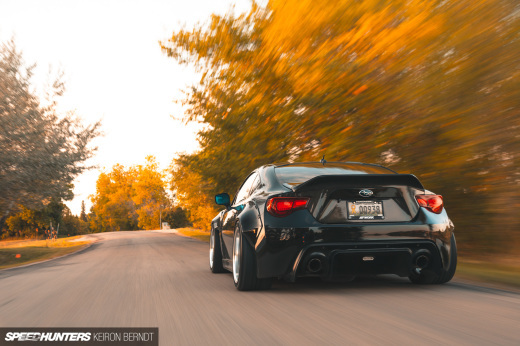 Rounding out the horsepower-producing modifications is a cat-back exhaust system from ARQRAY – a Japanese company that makes high end exhaust parts for a number of European cars. 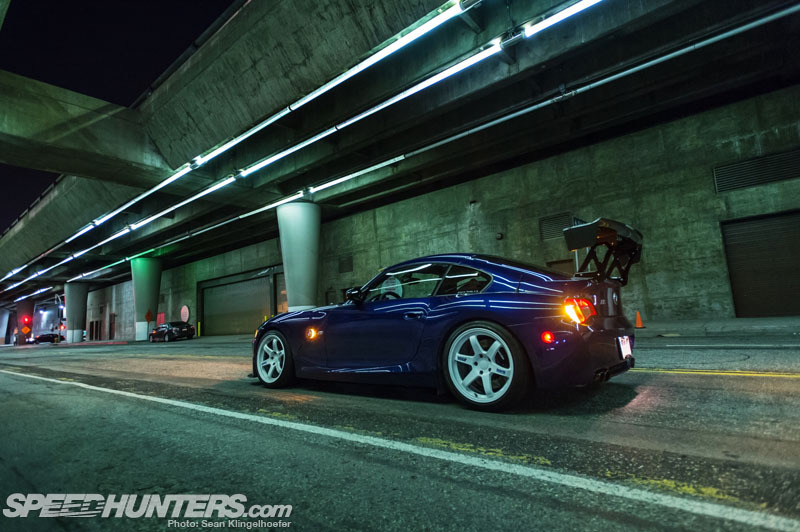 Continuing on to the suspension and chassis, Platte Forme equipped the car with a set of JRZ RS Pro dampers with Hypercoil springs, Ground Control sway bar links, rear shock mounts, upgraded bushings and a front tower bar from RE. 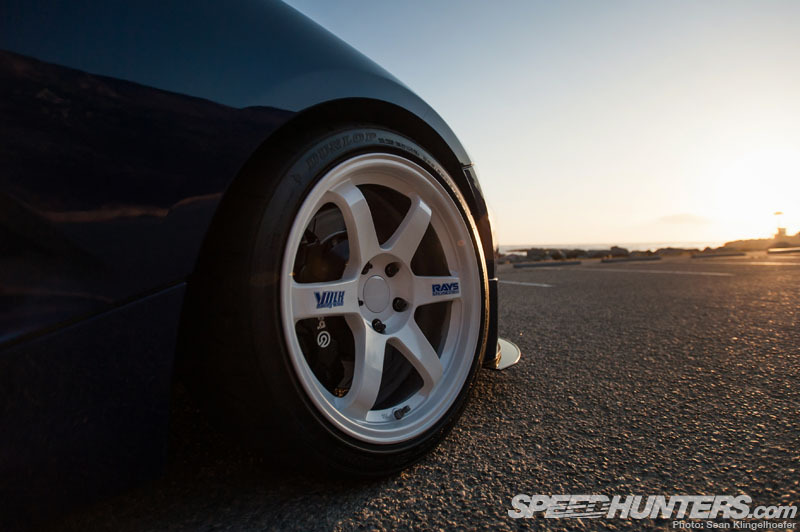 When it comes to wheels, it was only natural that it would choose something lightweight, forged and Japanese – something like the RAYS Engineering Volk Racing TE37. 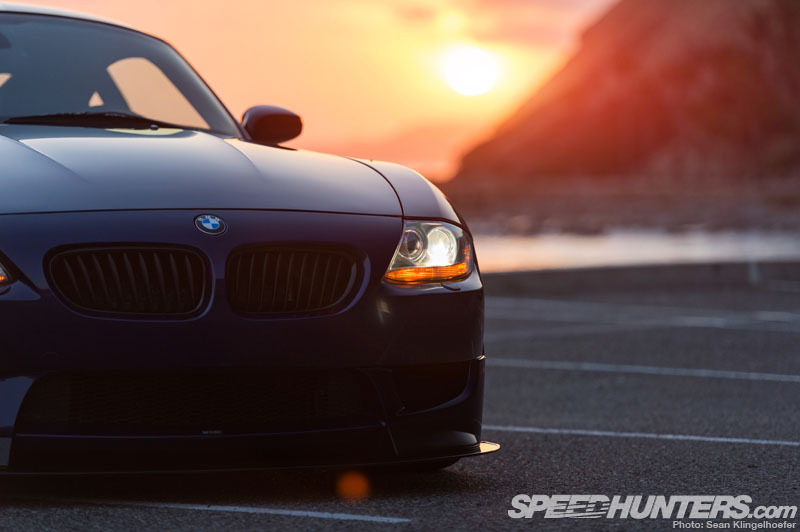 The TE’s on the Z4M measure 18×9.5-inch in the front and 18×10.5-inch in the rear. 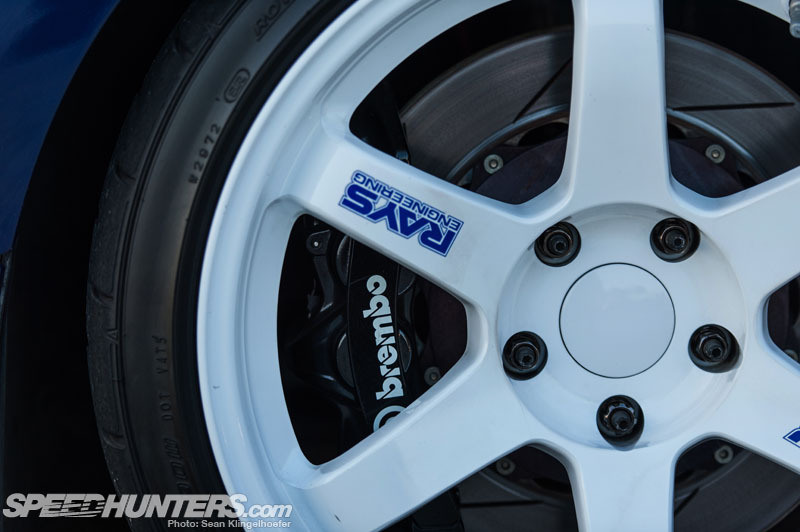 The spokes of the wheels are filled with a giant set of Brembo brakes, measuring 355mm in the front and 345mm in the rear with six and four pot calipers respectively. Another key part of the build was the aero work. 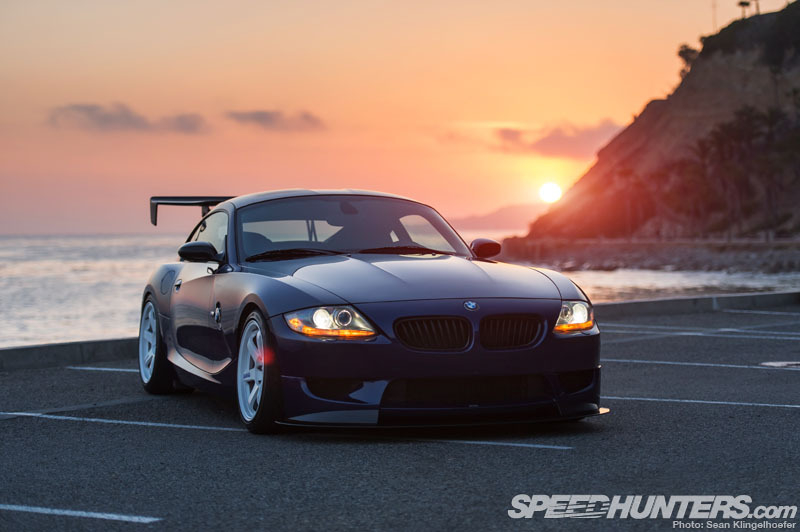 Once again Platte Forme went with a well-rounded mix of body additions that improve on both the Z4M’s aerodynamics and also give it plenty of style on the street. In the rear the car is equipped with a GT wing from VARIS, which is of course one of Japan’s most proven aero parts manufactures. 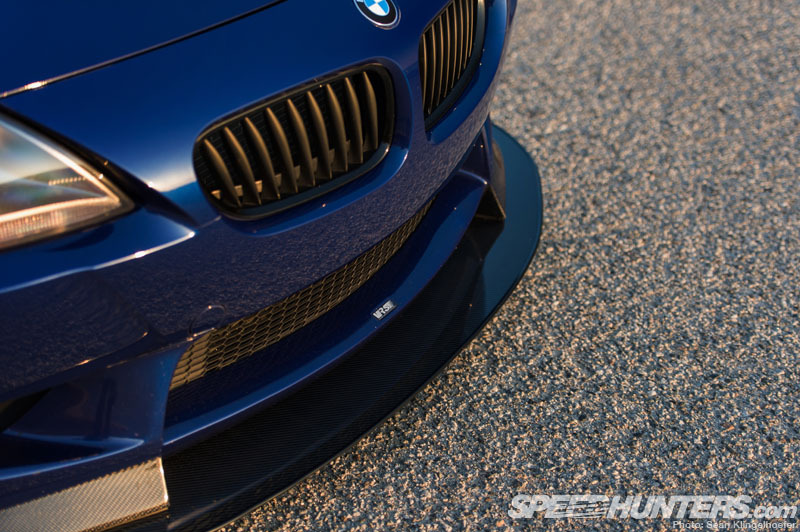 Up front, the car runs a VARIS front lip along with a chassis-mounted front splitter that’s an original Platte Forme a.g. item. 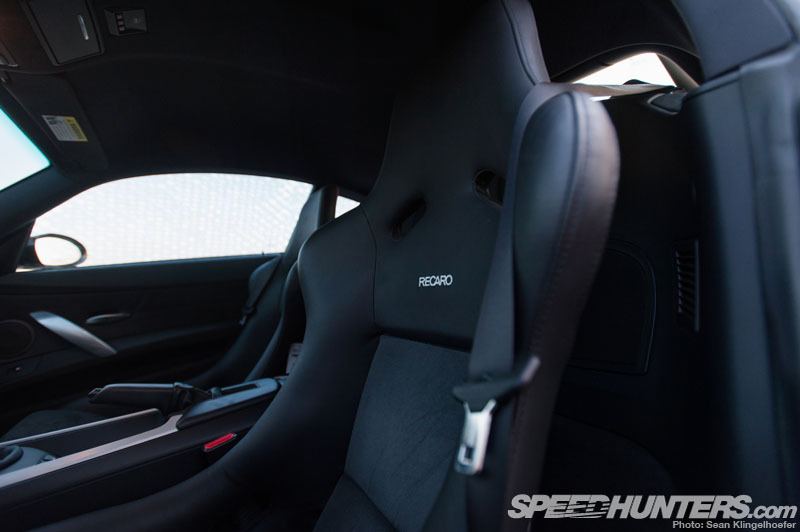 Inside, you’ll find just about everything you’d expect from a car that serves double-duty as a daily driver and weekend track warrior. All of the factory creature comforts have been left intact, but with a few upgrades suited to aggressive driving. 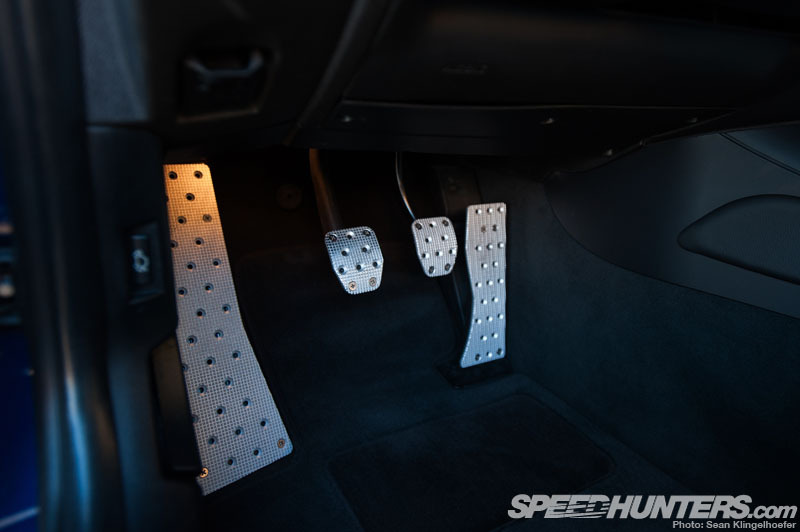 … while the stock pedals have been swapped out for a set of high-grip pieces from Ultimate. It’s a small change, but something that is surely noticed during hot lap sessions. And speaking of hot laps, when the guys took the car to Buttonwillow once they finished the build, the Z4M put down a very impressive 2:02 lap time on street tires. With more track time and the addition of the new front splitter, Toan doesn’t see any reason why the car shouldn’t be capable of breaking the two-minute mark. Very impressive stuff for a lightly-tuned street car. As for the Z4M, future plans including add a roll bar and also getting some more power from the engine. Toan has yet to decide whether he’ll install a new airbox and more aggressive cams, or go the forced induction route with a supercharger kit. When it comes to the shop itself, Platte Forme recently moved into a brand new facility and is in process of planning a new race build, which Toan says should be pretty unique. We’ll certainly stay in touch to see how that pans out. 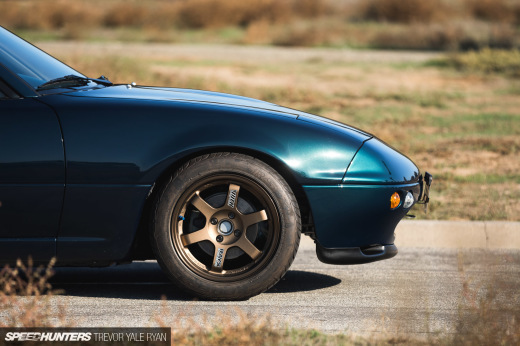 So yes, there’s nothing wrong with going the traditional route with your build, but as Platte Forme has proven with this Z4M – sometimes a little bit of international influence can go a long way.